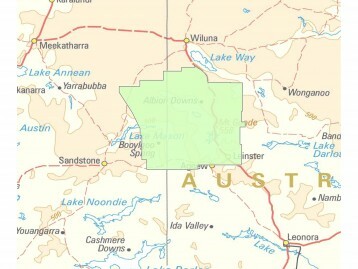 The claim was first filed on 17th June 2011 and covers approximately 13,623.41 square kilometres of land and waters located partly within the Shires of Wiluna, Leonora and Sandstone and encompasses the mining town of Leinster. The claim was contested by the State of Western Australia and two weeks of connection evidence was heard on-country from 27 July – 5 August 2015 with expert anthropological and linguistic evidence following in Perth on 27 – 29 October 2015. Extinguishment arguments and final submissions were made on 13 – 15 December 2015. The extinguishment submissions included a legal challenge to the validity of different forms of tenure granted the State of Western Australia on the basis that they were invalid future acts. On 16 December 2016 Justice Mortimer ruled in favour of the Tjiwarl claim group’s connection to the land. The judgment included a ruling that six miscellaneous licences in the determination area were invalid future acts with no force or affect against the recognised native title rights and interests of the Tjiwarl native title holders. On 1 February 2018 the Full Court of the Federal Court of Australia handed down reasons for judgment in favour of two separate appeals brought by BHP Billiton Nickel West and the State of Western Australia. The Full Court judgment has significant consequences for native title groups across Australia in relation to the validity of the “future act provisions” of the Native Title Act (which provides special procedural rights to native title groups) and about the beneficial interpretation of section 47B of the Native Title Act (which allows previous historical extinguishment to be disregarded when recognising native title). The Tjiwarl native title holders have filed an application with the High Court of Australia to seek special leave to appeal these aspects of the Full Court’s orders. Applicant Names: KN (deceased), JA (deceased), Shirley Wonyabong, Edwin Beaman, Kado Muir, James Calyun and Charmaine Tullock. The Tjiwarl #2 claim was determined together with the Tjiwarl #1 claim on 27 April 2017. Tjiwarl (Aboriginal Corporation) RNTBC is the registered Native Title Body Corporate on the National Native Title Register. Therefore, any access on to the native title area is regulated by the future acts process in the Native Title Act. Tjiwarl (Aboriginal Corporation) RNTBC has developed a standard agreement to offer to mining companies in relation to exploration work on their determined lands. Depending upon the location of the mining tenure, either a Land Access Agreement or an Exploration and Prospecting Licence will be offered. Tjiwarl (Aboriginal Corporation) RNTBC requires all mining companies who wish to explore on mining leases to commence negotiations on the impact that their projects have had or will have on native title. All other mineral and petroleum title applications will be assessed on a case-by-case basis. Please contact our Future Acts Officer, should you wish to access the Tjiwarl determination area, have any queries in relation to land access and future acts in the Tjiwarl determination area or wish to obtain a copy of the relevant future act agreement.